Yesterday evening featured an extremely late arrival into our hotel in Luzern, courtesy of a two and a half hour tailback on the motorway courtesy of the St Gotthard Tunnel. For this reason we'd made the decision to sleep in a bit and abandon our planned schedule in favour of spending a relaxed day in Europa Park. Just after five in the morning, however, a piercing wail tore through the silence of the hotel, followed in short order by excited shouting and loud knocks on every door in the bedroom corridor. My abilities with Swiss German are not at their best in the small hours of the morning, but it was still easy enough to decipher; get the hell out right now! When we were all outside the unfortunate night manager advised us of the situation in three languages. The hotel was not on fire, but a bomb threat had been received by telephone and there was no choice but to take it seriously. By the time the polizei had cleared us to return to the building there was little point in attempting to get back to sleep. We decided that a concerned citizen had felt it important for us to go to Steinwasen Park, and thus we did just that. Steinwasen Park is a small facility located on the side of a mountain in south-western Germany. 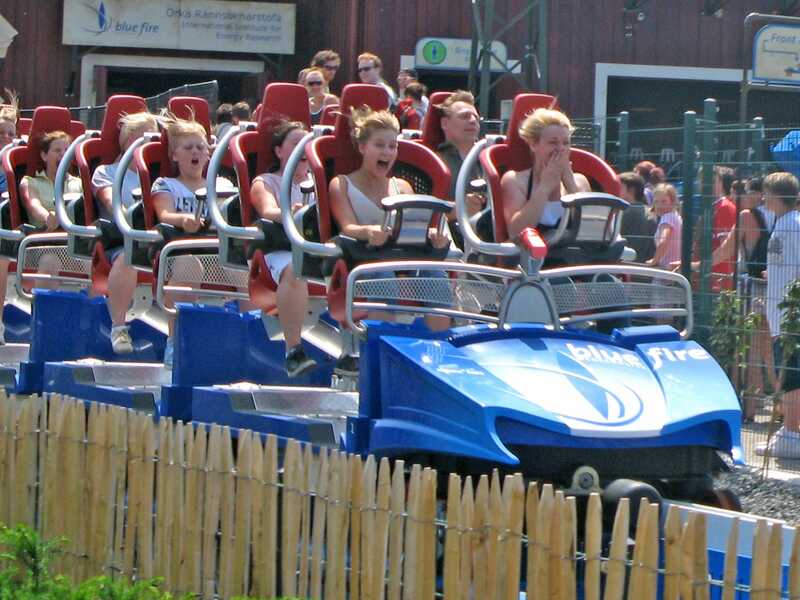 Though it has just four major attractions they are all excellent and worth riding multiple times. For me the high point was definitely the Rodelbahn, a trough based alpine slide taken to an extreme level with a layout that would be considered horribly dangerous anywhere except Germany. I found myself using the brakes on practically all of the corners to avoid becoming at one with the surrounding foliage, and even with that my second run was slower than my first! As an aside, the engineer in me was also intrigued to see the completely automatic mechanism for bringing the sleds back to the top of the mountain, something I've not seen elsewhere. The newest ride in the park is the River Splash, one of the new breed of spinning rapids rides that have been cropping up of late. This model features a vertical lift tower that lifts boats to the top while rotating one hundred and eighty degrees. Apparently this is not unique but it was the first version I'd seen, and it really made the attraction for me; after all, as the rest of the layout was standard fare. The other two rides share a common indoor area. Space Runner is the fastest and longest powered bob kart ride I've ever had the pleasure of enjoying, with a speed that bordered on the insane. Last but by no means least is Gletscherblitz, a powered coaster that, though fun, seemed slightly week against such exalted company. We arrived at a relatively quiet Europa Park shortly before noon, and over the course of the afternoon enjoyed quite a few of the major rides. Rather than rehash old trip reports I'm going to concentrate on writing a review of the new coaster this year, the utterly stunning Blue Fire (#1354). Over the last few years the world has seen an rapid acceleration (pun intended) in the number of launched coasters worldwide. The vast majority of the major designs have been from Intamin, though Gerstlauer and Zierer have also been getting in on the act. Mack is the latest manufacturer to come up with a launching system, and their design is sufficiently refined to put all the competition to shame. The ride station features three separate queues; front row, everywhere else, and a single rider entrance. There is no preferred seating available beyond front, which is a shame, but given the three train operation this is perhaps forgivable. The entrance to the single rider queue is most of the way down the main queue line rendering its benefits largely negligible, but it can still be used to avoid at least a small section of cattle grid. If it were me I'd be tempted to swap this queue out in favour of a back row queue, but that's the enthusiast in me speaking; I doubt the general public would care. The trains themselves use a new design of lap bar which is anchored to the rear of the car rather than the front, thus ensuring riders legs are completely free. There are no cumbersome over the shoulder restraints or seat belts, giving a sense of freedom unparalleled on similar rides. The lap bar includes a built in heart rate monitor with a digital readout, a rather neat idea that apparently needs some fine tuning still; at one stage the numbers shown were about what I'd have expected, but then on a later ride my heart rate abruptly dropped to zero during the third inversion. I've checked a number of times since, as far as I can tell I'm not actually dead, though perhaps I should watch The Sixth Sense again to see if there are any potential signs I'm missing. The train leaves the station into about fifteen seconds worth of dark ride leading to the launch track. Moments later, the train accelerates smoothly to its top speed of one hundred kilometers per hour to the accompaniment of a loud siren and a dry ice cloud. Somewhat to my surprise the trains negotiate the layout without even a single bump anywhere. This even extends to the fourth inversion, a ridiculously intense heartline roll that gives a hint of what the removed inversion on Maverick might have felt like. Hyperbole tends to be overused in coaster reviews, and I'm loath to even write this, but it has to be said; Blue Fire is a top ten ride which raises the bar for launched coasters everywhere. Mack has come up with a winner; parks with a few million to spend on a new ride could do far worse than this.